Leinster eased to victory away at Cardiff Blues in the Pro12 on Friday. The Irish side jumped into a 23-3 lead at half-time thanks to tries from Isaac Boss and Jordi Murphy, backed up by the kicking of Ian Madigan. Blues improved after the break and Jason Tovey's try and a Rhys Patchell penalty gave the home side hope that a comeback might be possible. But fly-half Madigan added his fourth penalty, taking his tally to 16 points, to see Leinster home. Leinster have now lost just one of their last 13 clashes with the Blues in all tournaments since 2007 - 11-3 at Cardiff City Stadium in the Pro12 on 19 February 2011. Although both sides were depleted by international calls, they showed plenty of enthusiasm in a lively opening before Leinster took the lead with a straightforward Madigan penalty. The Blues were the first to threaten the try line, fly-half Patchell looping around centre Dafydd Hewitt before firing a long pass to Owen Williams. The winger took it at pace and kicked ahead, only for the ball to bounce too high for him to gather. Patchell, again released by Wales Under-20s, equalised with a 40-yard penalty, but was off target with a similarly long-range effort, before Leinster lock Tom Denton was sent to the sin bin following an off-the-ball incident. The Irish province were still a man short when Madigan put them back in front with a penalty that struck a post and the bar before dribbling over. The fly-half added another three points - taking his season's tally to 100 - when the Blues infringed as they tried to recover from a goal-line fumble by Tovey. Leinster emphasised their superiority with a try by scrum-half Boss, who squeezed over from a ruck leaving Madigan an easy conversion. The Leinster pack then drove a five-metre scrum and number eight Jordi Murphy dived over, with Madigan's conversion giving his team a 20-point interval lead. A good handling move saw Tovey sneak in at the corner as the Blues started the second half with renewed vigour, but Patchell's conversion attempt never left the ground as the kicker staring ruefully at the Arms Park mud. 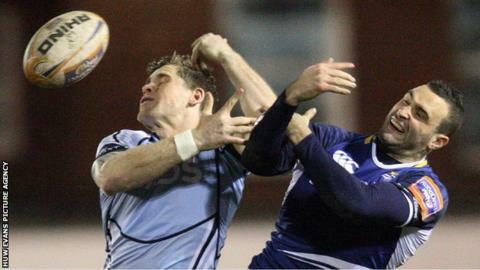 Williams burst past two tacklers on the right touchline, but the Blues had to settle for a Patchell penalty for offside. Patchell raised Blues hopes when he danced through to the line, but referee Peter Fitzgibbon called play back for an earlier infringement. The disappointment was heightened when Madigan stroked over a penalty on a rare Irish visit to home territory, although he was wide with an attempted drop-goal. Leinster re-established control as the game petered out with then usual flood of replacements, but never seriously threatened to claim a bonus point. Cardiff Blues: Jason Tovey; Owen Williams, Gavin Evans (capt), Dafydd Hewitt, Harry Robinson; Rhys Patchell, Lewis Jones; Sam Hoobs, Rhys Williams, Taufa'ao Filise, Macauley Cook, James Down, Michael Paterson, Rory Watts-Jones, Robin Copeland. Replacements: Smith for Evans (41), Sweeney for Hewitt (76), Walker for Jones (66), Trevett for Hobbs (76), Breeze for R. Williams (47), Andrews for Filise (47), Navidi for Cook (47), Hamilton for Watts-Jones (66). Leinster: Dave Kearney; Andrew Conway, Brendan Macken, Andrew Goodman, Darren Hudson; Ian Madigan, Isaac Boss; Jack McGrath, Aaron Dundon, Michael Bent; Leo Cullen (capt), Tom Denton; Dominic Ryan, Shane Jennings, Jordi Murphy. Replacements: Reid for Conway (47), O'Malley for Hudson (58), T. Sexton for Dundon (56), Hagan for Bent (49), Marshall for Ryan (49), Ruddock for Jennings (48).